I love a bit of a feminine touch to an outfit, so I knew this FrilledNeckline See-Through Dotted Shirt* would be the perfect piece to try the style. 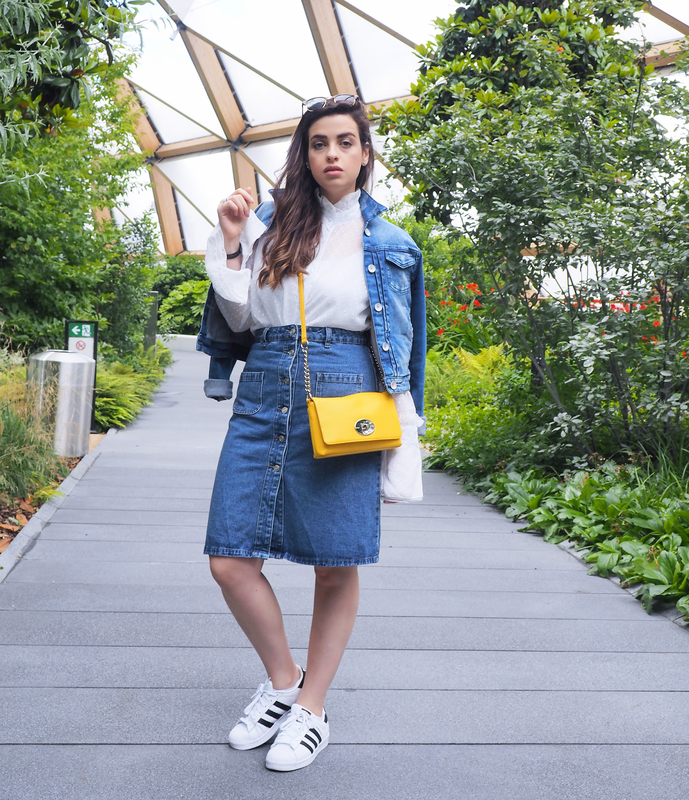 Feminine ruffles give summer looks a touch of fancy and romance but for the sunny season, ruffles and frill have been given a sophisticated makeover and are more wearable than ever. 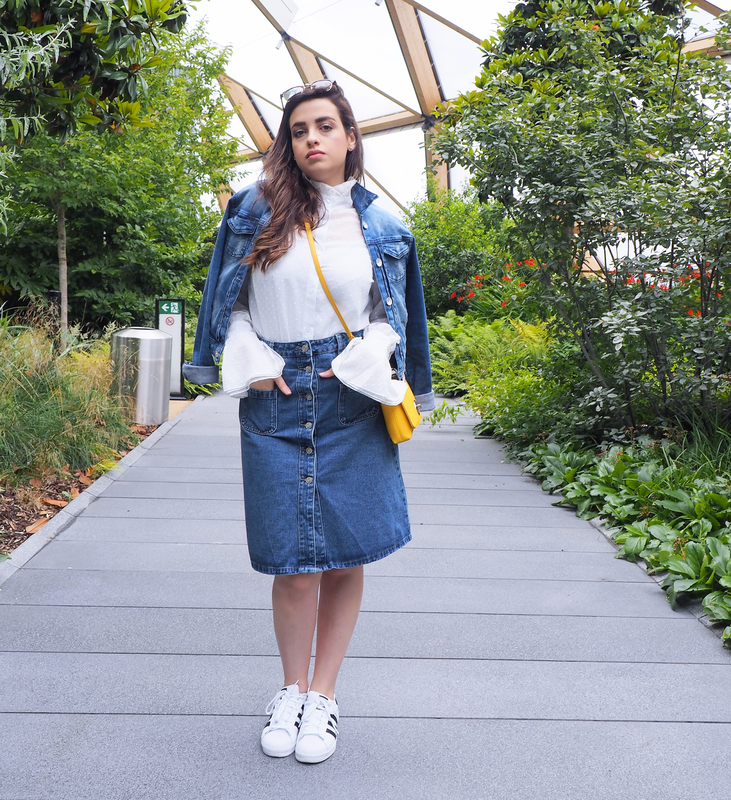 If you are worried about looking too girly or resembling an 8 year old in a birthday party, pairing frills with a neutral palette, denim and tomboy footwear can offset the femininity and childishness whilst still being chic, mature and playful. For those only dipping their toes into the trend, going for a simple blouse or ruffle trim shirt, which will both look great teamed with a pair of boyfriend jeans, will work just nicely. Similarly, tucking a frilled shirt into a pencil skirt or a pair of tailored trousers yield a more grown-up vibe if that's what you are looking for. Observe how I styled my frilled piece. 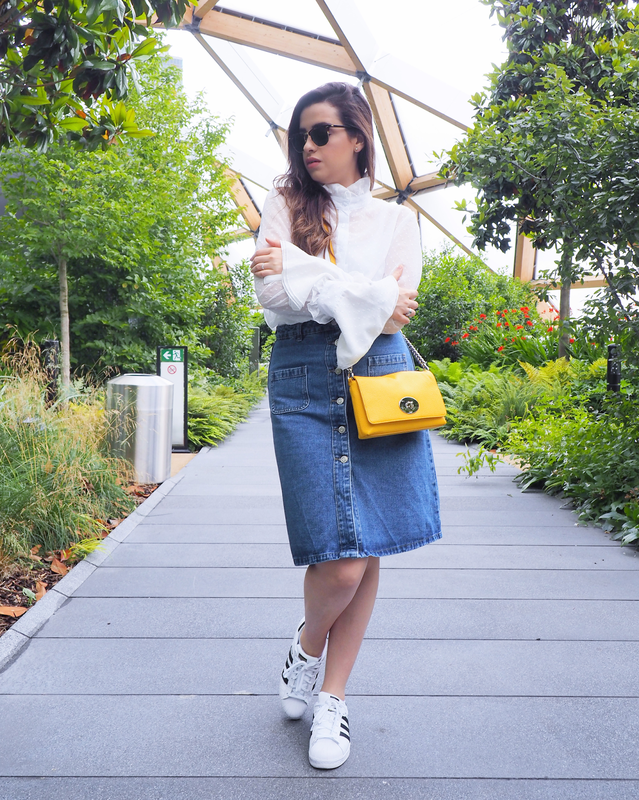 For my getup I knew I wanted to pair this gorgeous shirt (albeit slightly oversized) tucked in denim to give it more structure and a more defined silhouette, making my button-down skirt (which I also styled here) the ideal choice, after all a more casual getup is much more me. As I said previously, frills look great with hoyden-like footwear and I've lived in Adidas trainers all season so far so definitely the one to go with. The all-white sneakers trend (which I talked about in more depth here) is for sure one I don't see going away any time soon and I'm glad as I get to wear all the pairs I've bought recently over and over again. 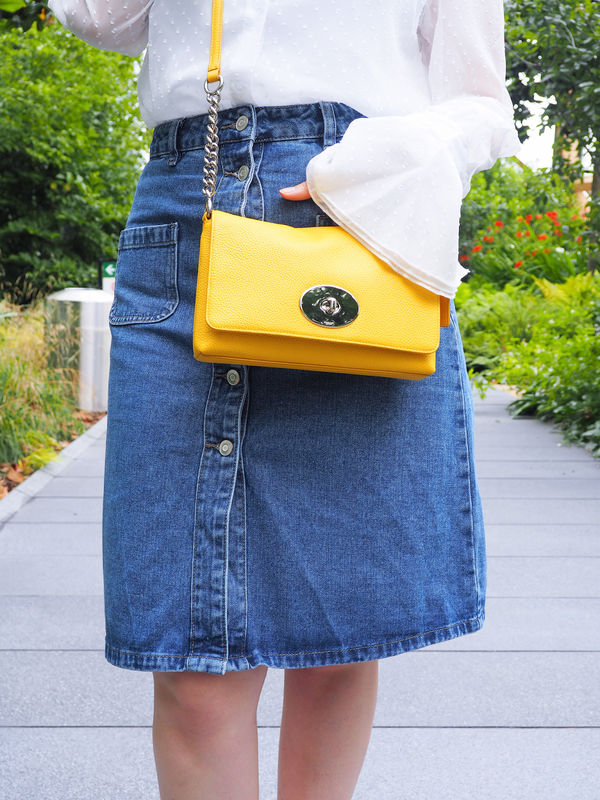 To really make this a summer's worth outfit, the final touch is this amazingly beautiful Cross Town Crossbody bag* in Yellow from Coach which I received and unboxed on Snapchat last week (follow me on Snapchat "pamscalfiblog" if you don't yet) and wore throughout the entire weekend. I'm loving the end result, but what do you think? From full on glamour in cocktail dresses to a girly injection of fun on a simple shirt, everyone is wearing ruffles and frills in one way or another; will you be trying the trend too? Let me know below! In love with the frills! Well I for one love the top! It's so pretty but edgy as well! 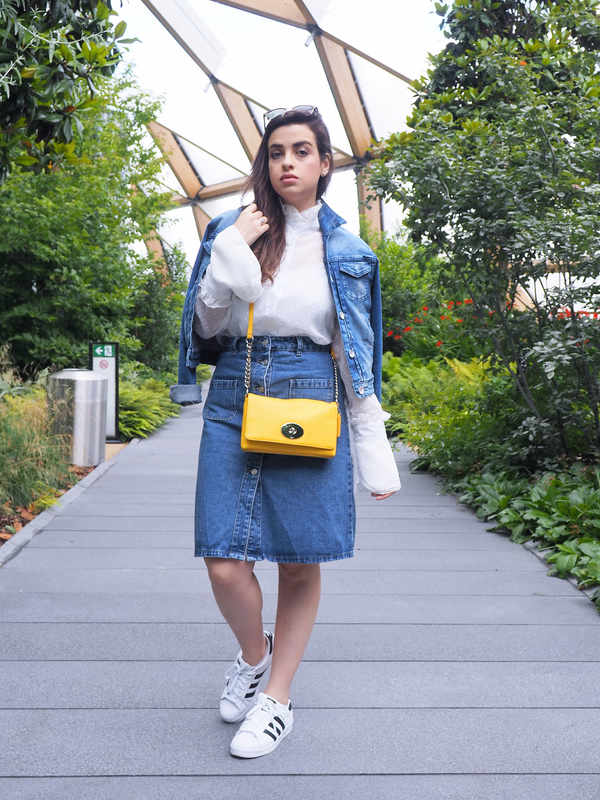 I love the way you have teamed it up with the denim jacket and skirt! The yellow back is the perfect amount of colour! Really lovely look hun! Não sou grande fã de saias de ganga! Love the blouse! I don't have many clothes with ruffles or frills but I got one from H&M for holidays and I love it! Fica-te mesmo bem, adoro o look! Omg I love this denim look ! !That blouse is a must! Lovely outfit darling! Thanks for sharing. I´d wear them on my sleeves like you pictured here, but overall I am not a big fan of ruffles and frills. Lovin this look! It's so creative. Ruffles are so romantic but when done in moderation. Such a gorgeous look! Love it! Such a cute outfit. Really love that vibrant yellow bag!! I love the high neckline of the top, Pam, gives it a beautiful Victorian touch to it. And that bag is beautiful, small enough so it's easy carry but big enough to stuff lots of stuff in it. I always see ruffles and immediately think dressy but I love this blouse and how you paired it with denim and sneakers!! 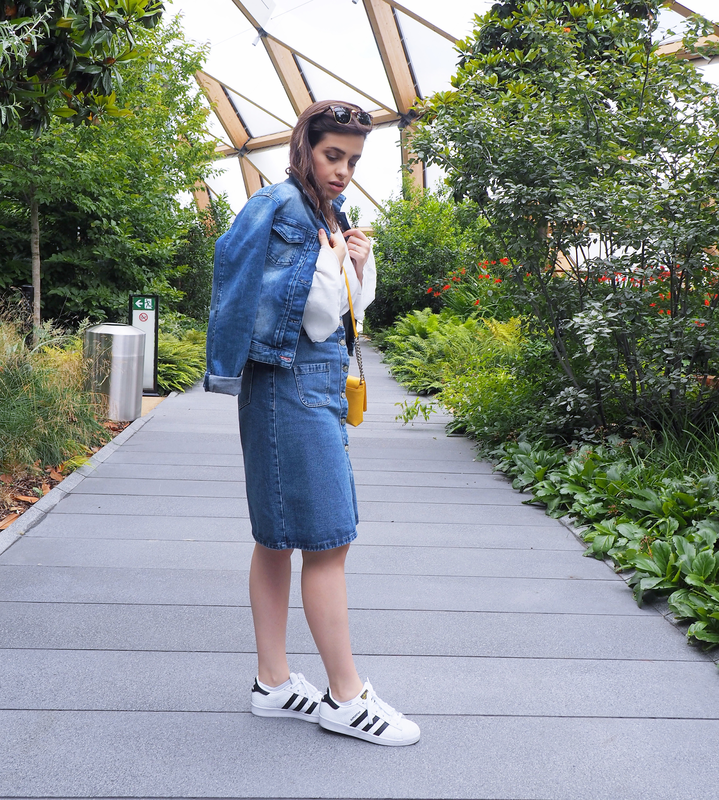 You really can't go wrong with some double denim! You look great! I like how you made the ruffles more casual with the denim and sneakers! your outfit is so feminine!!! 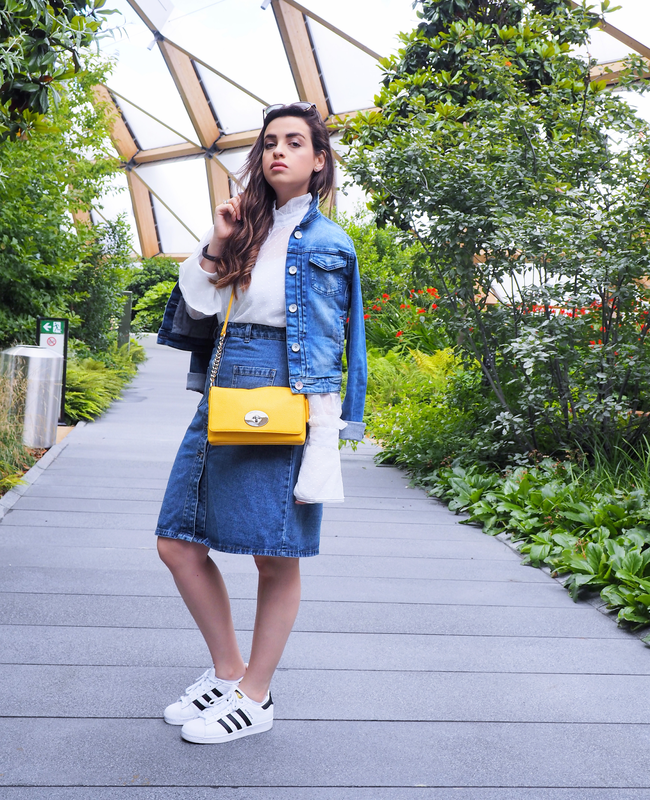 Loving this denim on denim look! And the yellow bag is gorgeous! Such a perfect look! Ruffles are so feminine and romantic, but I love how you switched that up with denim and sneakers. You adopted this trend and added your won style and that's genius! Look maravilhoso amei a bolsa lindas imagens, tenha uma semana abençoada. You gorgeous little thing you! Loving the combo. That bag is so bloody gorgeous! Stylish blouse. overall look is cute. I'v'e never worn ruffles or frills before but that's because I'm generally afraid of it. You've given some really useful tips to make it wearable, though. You look lovely, Pam, and I love that you went for double denim with it! You look absolutely gorgeous, as always! Also, I love your sunnies and pop of yellow bag! I love ruffles and frills! Have been wearing these kind of tops throughout summers. 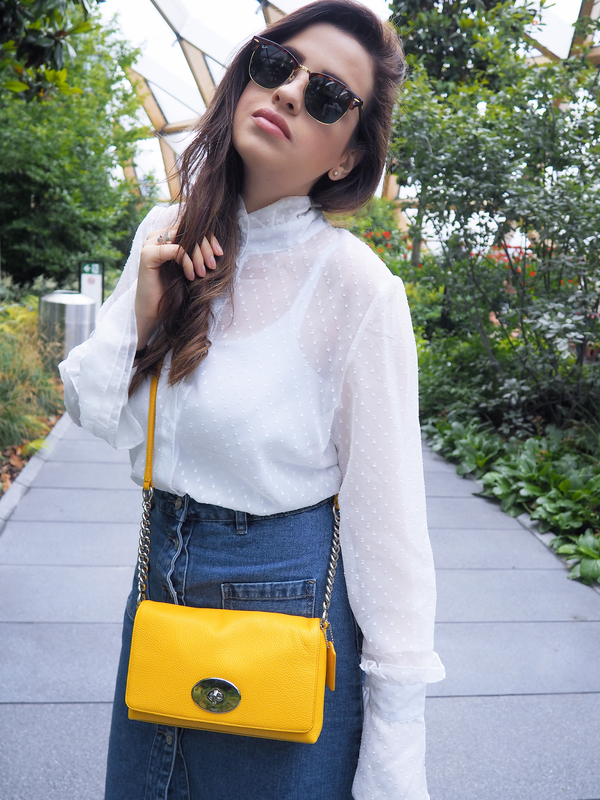 That yellow bag is perfect for the season <3 You nailed this outfit, Pam! Oooh that shirt is so cute love the design, yo styled it perfectly. You're totally right, ruffles are a great thing so far. Great Look. You look beautiful as always <3 love that bag! Love the styling Pam, the colours are all so great together! This outfit is beautiful! 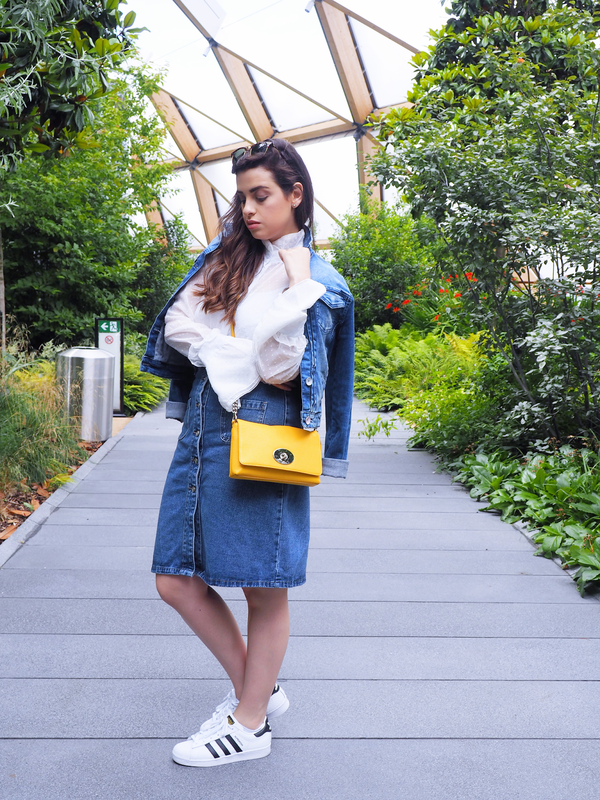 Loving the double denim and a pop of yellow! I really like how the top looked when you took off the jacket to show it off - that ruffled flared end at the sleeves is gorgeous! So lovely this shirt! And I love the classical look with denim!